Keurig found its way into our hearts years ago with its K-Cup machines, which made getting our daily doses of caffeine so easy, we were often shaking at our desks before the day was over… in a good way? Well, now they’re venturing into realms we never knew were even possible (cocktails!) thanks to the Keurig Drinkworks home bar. Much like the K-Cup machine, the Drinkworks home bar, created in collaboration with Anheuser-Busch, uses pods to work its magic. Each pod is filled with spirits and mixers and churns out a drink that has about 15 percent alcohol. Just insert the cocktail pod into the machine, place the suggested glass below, and voilà! It chills the pods to perfection and carbonates pods that are meant to be fizzy. Pair with the recommended garnish, and you’ll feel transported to a chic martini bar, even if you’re actually just wearing sweatpants in the kitchen. There are 18 different drinks available, including everything from a classic gin and tonic to a mai tai. We have to admit, using a pod to make a two-ingredient drink like a gin and tonic seems a bit silly, but when it comes to tropical drinks like mai tais that often call for expensive bottles of liqueur you only end up using once, the Drinkworks home bar has you covered. Not a fan of cocktails? There are beer and hard cider pods too. The machine itself costs $300, though it’s currently only available to order in St. Louis, Missouri. Residents of the rest of Missouri, California and Florida can preorder the machine, and the rest of the country should be able to soon. The pod collections start at $16 for four or you can buy them for $4 each, which is way less than what you’d pay for a drink at most bars. 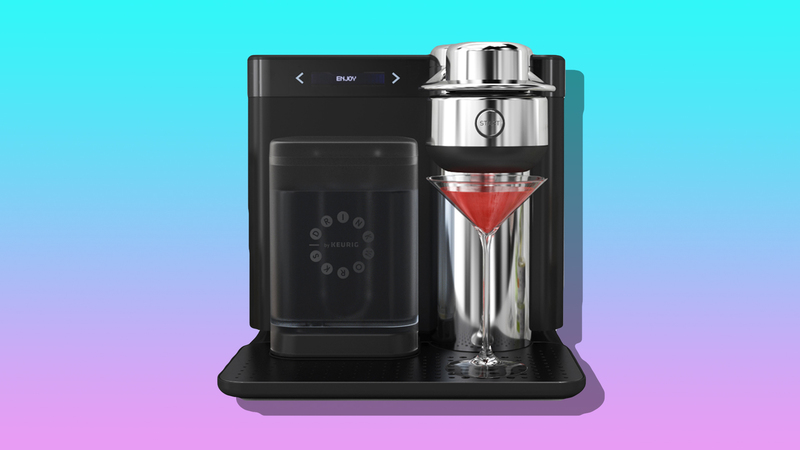 If you’re tired of getting stuck making drinks for your guests at parties or just really wish you could have a margarita at any time with literally the push of a button, then the Drinkworks might just be what you’ve been waiting for.